We make an early start, as we plan to stay tonight in the Phu Chong Na Yoi National Park, where our bungalow will be beside a thunderous Waterfall and just a jungle trek away from The Emerald Triangle...the fabled conjunction point of borders of Thailand/Cambodia/Laos. We make the road trip without major incident...although do get denied access to one National Park, and we do find ourselves in a Mom&Pop store where the canned beer is miraculously 30% cheaper than any other retail outlet in Thailand. 1. A Soldiers barricade denies us access to the Emerald Triangle viewpoint by 2 kilometres...some un-broadcast falling-out among neighbours! 2. The waterfall is close by but, alas, the volume of flow has been reduced to a mere trickle of about the volume of a dog lifting its leg on a car wheel! 3. 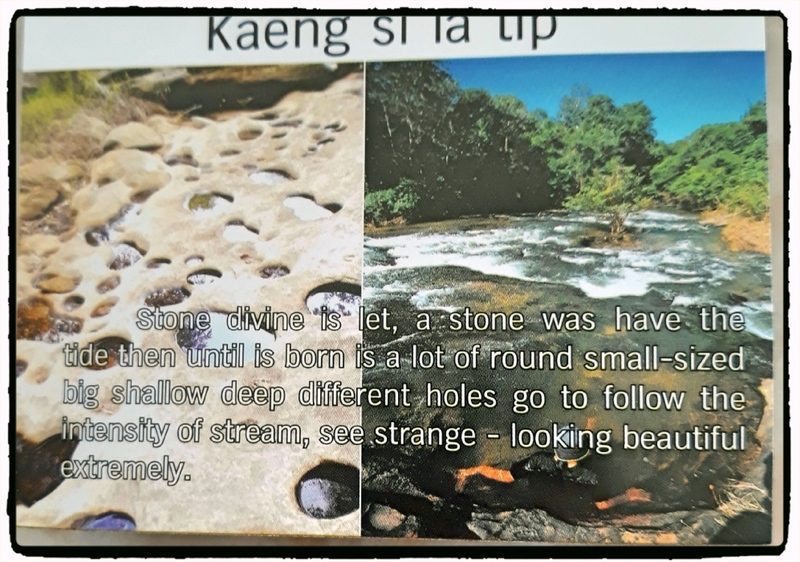 We are studying the rock pools [see main image] , but finding it difficult to reconcile with the wondrously LSD-fueled poetic description offered in the brochure [shown below]...this is the "stone divine is let, a stone was have the tide then until is born is a lot of round small-sized big shallow deep different holes go to follow the intensity of stream, see strange-looking beautiful extremely." Ray: Of course, we found these little set-backs hilarious! Ray: All this great hilarity, Chris, and the trip has barely begun. I find these rock pools fascinating with all the reflections of the threes around. I like the poetic words. Ray: I loved reading those words, Philine...poor translation has rendered the words poignant and poetic. Ray: I did my best with processed cheap beer twice during the night, Alan, but it seemed too little and too late. Not disappointing at all... set-backs like this add to the fun of these trips. That description is ineffably ungrammatical. Ray: Isn't it gorgeous stuff, Larry! Travel promotions eh, don’t you just hate them? Perhaps you slept better with a thunderous roar by your bungalow Ray. Ray: Travel promotion brochures can be wonderful after being subjected to inept translation. Koen...the bloke in the red hat...is a Travel Agent, so of course we blame him for everything that turns out to be underwhelming, even though we have not allowed him to do any planning and are generally deaf to any advice he tries to give us. Ray: Oh oui ... nous avons trouvé beaucoup d'autres activités intéressantes, y compris des interactions avec les habitants, Claudine. Ray: No difficulties here, Tom...we are having a fine time...things don't always work out the way you expect. Ray: You are right, Bill...we are in good shape. I guess it would be fair to say you were all slightly underwhelmed! Ray: Of course, we blamed Koen [who is a Travel Agent] for all this, even though we ignored anything he might have been trying to tell us during our planning. These are lave floes are they not? I have seen similar. I love strange or interesting rock. Ray: This is exposed sandstone, Mary, and we are standing on what is a riverbed during the Wet season...according to the tourist blurb, folks raft on this bit of river in the Wet. Ray: The attractions at this National Park are evidently Wet season highlights, Peter, but this is near the end of Dry season. No matter, though, as we are good at laughing at our mis-fortunes, and found other interesting stuff. Also...we had a boot full of cheap beer! Ray: I am so impressed with the prose that I have kept the travel brochure, Louis. is it possible you were not primed enough by the beer to see the divine stone, Ray? Ray: Could be as you suggest, Ayush.